Train hard, train smart with the Hydrofoil Ankle Float. The LHYDAF is specifically designed for core development and strength training, as it forces the swimmer to tighten his or her abdominals and lower back muscles to maintain proper positioning and form.An industry-first design features easy-on/easy-off circular cuffs that fit securely around ankles, so they won't slip or slide. Depending on which side you wear it, this TYR ankle float offers two different levels of resistance. When the flatter size is facing up toward your knees (TYR logo is upright), the resistance is greater. When the contour side is facing up toward your knees (TYR logo is upside down), the resistance is lessened. I just purchased this so I've only used it a few times. 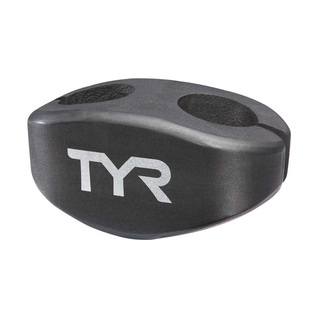 If you're comfortable swimming with a pull buoy, you shouldn't have a problem with the TYR Hydrofoil Ankle Float. It's slightly easier to rotate your body with the ankle float than with a pull buoy. Overall, if you have a pull buoy, and you're happy with it, I'm not sure the TYR Hydrofoil Ankle Float is absolutely necessary. Based upon other reviews, I disregarded TYR's body weight recommendation for the small and large. I weigh 180 lbs and the recommendation was to get a large. Instead, I purchased a small which provided me with more than sufficient buoyancy.